Two laws have been passed after alterations in the order of the day of the Catalonian Parliament—otherwise, they would have been blocked by the delegitimized Spanish Constitutional Court. After a marathonic session of filibustering by anti-independentists (12 and 14 hours respectively), Catalonia approved two bills that bring the region closer to the dream of independence from Spain: the Law of Self-Determination Referendum was passed on Wednesday night, and the Law of Juridic Transition was passed Thursday night. The former establishes that a binding referendum will be called next October 1, in which citizens will have a say on Catalan independence. The latter will provide a constitutional framework after a declaration of independence if the “yes” vote wins the referendum to be held on October 1. Just a few hours before the vote on the second bill, the Spanish Constitutional Court had suspended the Catalan independence referendum and its legal framework, following allegations by the Spanish government which claimed the vote is illegal and unconstitutional. Opposition leader, Inés Arrimadas, referred to the transition law as “something which is not a law, despite being called a law”, and which “will never come into effect” and that she expected an immediate ban of the bill. “It is no surprise that the Constitutional Court has already suspended the referendum law, just like it will probably do with the document that is currently being voted,” she said. Madrid’s prosecutors are threatening representatives, officials and citizens to try to make them desist of having the referendum. The Spanish capital has also sent civil guard officers to enter the press of a newspaper in the city of Valls, to intimidate them, violating freedom of speech. The people of Catalonia reacted in a heartbeat. In 48 hours, over 30 thousand citizens took to the streets to confront the threat. This community is organized and doesn’t easily give in to intimidation. 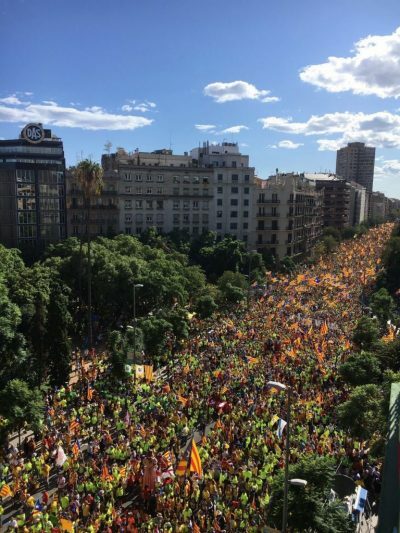 Today, on Monday September 11, 303 years after the fall of Barcelona, over a million Catalans will hold an ever bigger demonstration to prove the world they are united in their will to create a new Republic and a better world.